The Dwyer Series 679 Pressure Transmitter is compatible with a wide range of gases and liquids, and is specially designed for weatherproof service NEMA 4 (IP56). The Model 679 can measure pressures with an accuracy of ±.25%. 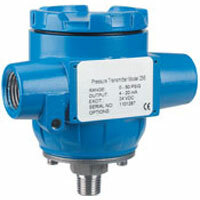 This model provides a 4-20 mA output and is field adjustable. Service: Corrosive liquids and gases. Accuracy: ±.25% FS (includes non-linearity, hysteresis and non-repeatability). Pressure Limits: See Catalog page. Loop Resistance: 800 ohms.Zero and Span Adjustment:±15%, non-interactive. Stability: Less than .5% FS/year. Compensated Temperature Range: -4 to 176°F (-20 to 80°C). Pressure Connection: 1/4" male NPT. Wetted Parts: Corrosive resistant 17-4 PH Stainless Steel. Electrical Connections: Two 1/2" conduit ports. Weight: 13.4 oz (380 g).